On the western corner of Exmouth Market, opposite the hipster hangout Caravan and beside Nero’s is this lovely, earthy, French-style cafe. New, I think – yes, since November 2014. Probably about 20 small tables inside and a couple outside, it’s a relaxed place at 8:30 on weekday mornings. The central square bar has a commanding view over all patrons, so service was quick and friendly. It is more of a restaurant than just a coffee shop or café, but relaxed enough to be welcoming and family-friendly. Espresso was – thankfully – Italian, not French style. Citrus, sweetness, very like a long Monmouth coffee. Very pleasant, though I am glad I put a sugar in. Lovely place; I’ll come again. 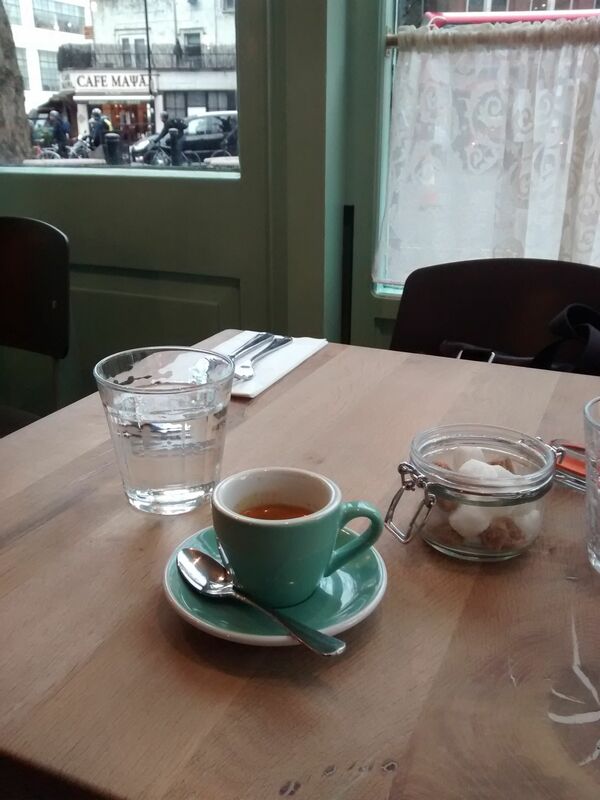 Posted on October 11, 2015 by espressolovinPosted in North LondonTagged Exmouth Market, French, restaurant. Next Next post: Poll: Where do you think the coffee is best?